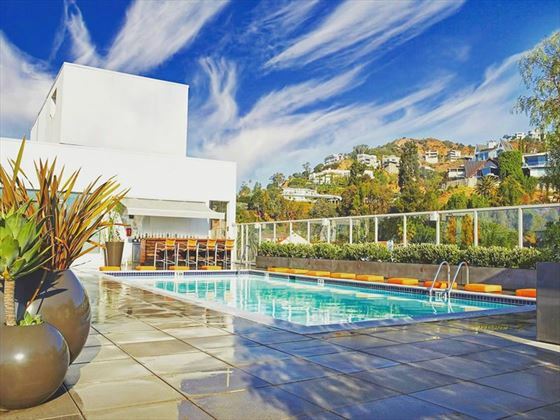 A sophisticated and modern hotel in one of the most lavish regions in America, the Andaz West Hollywood exudes style and luxury. The property prides itself on its personal touch, with dedicated hosts tending to your needs and friendly staff helping you to settle in straight away, so you can make a start on relaxing in your spacious room or suite, looking out to great views of the city skyline or Hollywood Hills. The restaurant, Riot House, takes inspiration from local farmer’s markets and seasonal produce for a fantastic menu of hearty and sustainable dishes. 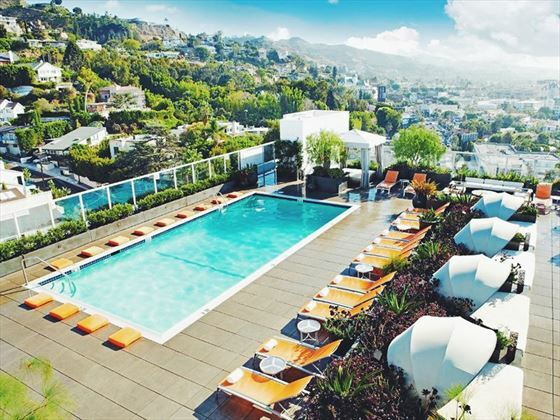 If you want to make the most of the view, there’s no better spot than the rooftop pool (the highest pool in Los Angeles) where you can indulge in the sunshine with cocktails, snacks and incredible vistas. 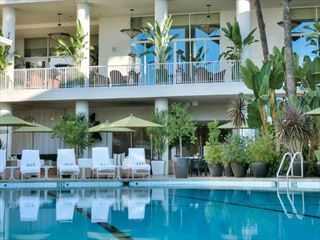 The cosmopolitan décor and laid-back atmosphere creates the ideal setting for your Californian escape. The Andaz Hotel is located at the heart of the action, where you’ll find yourself in a great position for exploring Sunset Boulevard, Beverly Hills and the shops, galleries and entertainment of Los Angeles. Situated on the renowned Sunset Strip in West Hollywood, the hotel is central to a host of fascinating attractions and entertainment. Close to upscale boutiques and shops, nightlife and myriad restaurants and bistros, the Andaz West Hollywood is in a great location for making the most of the area. The hotel provides 239 rooms. Suite – The hotel features a selection of suites with amazing views of the skyline and Sunset Strip, separate living room, sunroom with floor-to-ceiling windows and luxurious touches such as chandeliers and designer furnishings. The hotel also offers accessible rooms. 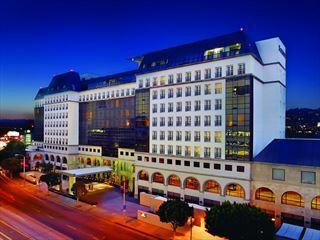 The elegant Beverly Hills Marriott Hotel is ideally located within walking distance of Rodeo Drive and offers warm hospitality in a landmark setting - a great option for couples seeking a convenient yet stylish hotel. Home to star-studded events, with the excitement of Hollywood and the elegance of Beverly Hills right on its doorstep, there's never a dull moment to be had at the Beverly Hilton. With stunning interiors fusing French-style and Hollywood glamour, this property is an ideal starting point for exploring the famous museums, amusement parks, zoo and the many other highlights this exciting city has to offer.